HHS is trying to identify all the people in a panoramic picture of the cast of the Pageant of 1938. Click the image above for more info about how you can help us in this project. HHS is sponsoring charitable gaming at the Ocean Gaming Casino at Hampton Beach. The first dates of the year are January 21 and 22, 2019. Click here for more info. Come See the Souvenir China Exhibit! 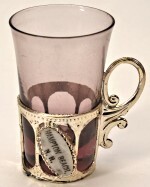 Our Hampton Souvenir China exhibit is now on display at the Tuck Museum. Click here for more info. HHS celebrated its 90th anniversary in 2015. 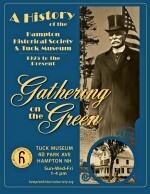 As part of that occasion, an exhibit was created at the museum called Gathering on the Green: A History of the Hampton Historical Society and Tuck Museum from 1925 to the Present. It consisted of a series of posters for each decade, spread throughout the museum. Visitors would follow the route through the museum and read each poster. At the time, we wanted people to come to the museum to see the new exhibit, and didn't want to present the full text of each poster on this website. However, now that some time has passed, we are now presenting those posters in web-friendly format for easy online viewing. So, if you want to read a lot of interesting info about the history of Hampton and HHS, presented in a lively format (derived from the original, beautiful posters), go to the upgraded Gathering on the Green page. 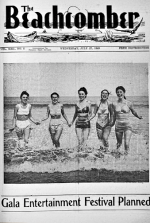 Announcing a major addition to our website - a collection of 23 years of the Beachcomber Newspaper, digitized and viewable online, encompassing the years 1936 thru 1965 (there are some gaps). All issues are viewable in high resolution, which means you can actually zoom in on the screen and read individual articles. We think that many people will be interested in viewing these old newspapers. It's hard to stop once you start! The archive is permanently linked from the Town Histories and Miscellaneous section of the Genealogy and Research page. Click here for the main index to the Beachcomber Archives and enjoy!